Here is the link below to sign up. Schedule: Saturday: 9:00 AM, 1:00 PM and 5:00 PM. Sunday: 9:00 AM and 1:00 PM. Assembly 15 min. prior to each starting time. There are two 60 arrow rounds / NFAA 300 round. Both rounds must be shot for championship. NFAA or USAA membership is required to shoot for either Championship. 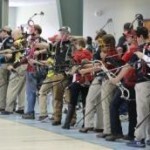 GBAA or GAA membership is required to shoot for the Georgia State Championship. A Guest class is available for NFAA/USAA members outside of state or section or Non NFAA/USAA members. Guests can NOT shoot for State or Sectional Championship. NFAA and GBAA memberships can be obtained at the shoot prior to registration. Please mail pre-registration with your check, postmarked by February 20th. You may also complete online registration at http://gbaa.georgiaarchery.com/ by March 1st. NOTE – The GBAA website is established for online registration of State tournaments, however; registration for the SE Sectional will be accepted with your registration for the State tournament by indicating “YES” for question “Shooting the NFAA Sectional Also?” SE Sectional shooting styles, if different from the State, need to be entered into comments field also. The tournament fee for registrations made online will be collected at check in. LATE registration will be available at the shoot – minimum 1 hour prior to shoot time!!! 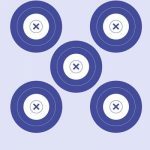 Additional Information / Contacts: Visit http://gbaa.georgiaarchery.com/. We would like to thank the 170+ Shooters and all the family & friends that came out this weekend. The Champions Made From Adversity for hosting this great tournament. Also the 4-H team for providing the food & drink vending. Below are the Official Results For the State Tournament. Open practice Saturday and Sunday is at 8:00 AM, and between rounds. Georgia I-20 exit 199, Drive east 1.6 miles and turn left on to Eisenhower Drive. Garrett Gym is on the right. Numerous hotel/motels and restaurants located at Georgia I-20 exit 199. Jenny Baldowski: 706-284-1476, or Tom Boots: 706-799-8457. We had a great turnout with 112 shooting.